Field Service 8.6.0.274 https://trials.dynamics.com. See additional notes at the end of this document. To learn more about mobile projects, see our topic on installing the Field Service Mobile Configuration Tool. New Dynamics 365 trials created through https://trials.dynamics.com will install the latest generally available Field Service solution. 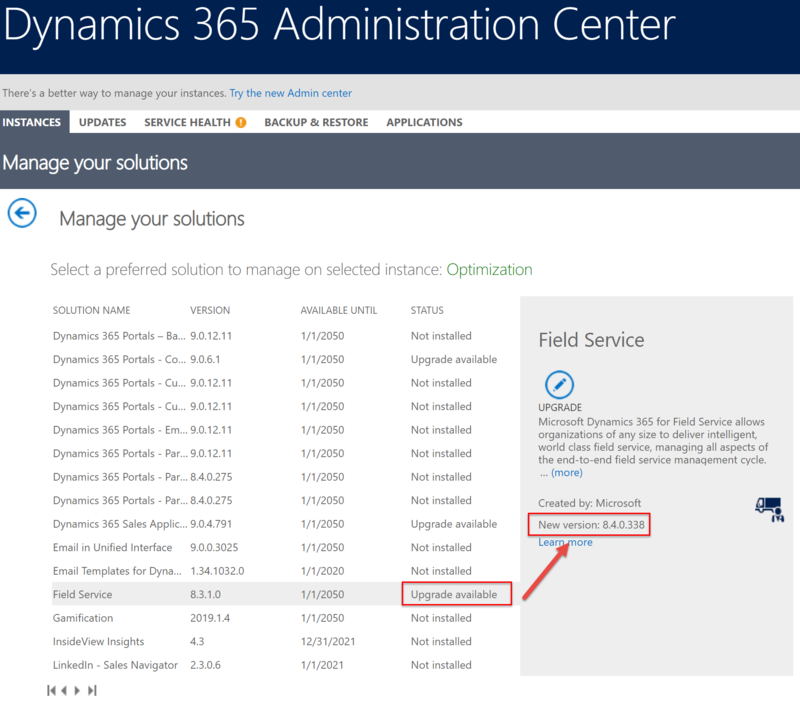 You can upgrade your solution in Admin Center > Dynamics 365, as seen in the following screenshot. If a new version of Field Service is available, you can opt-in to upgrade Project and Field Service - Unified Interface and an upgrade will become available in the admin center. Installing Field Service Mobile from the Windows Store can allow for automatic upgrades of new versions.